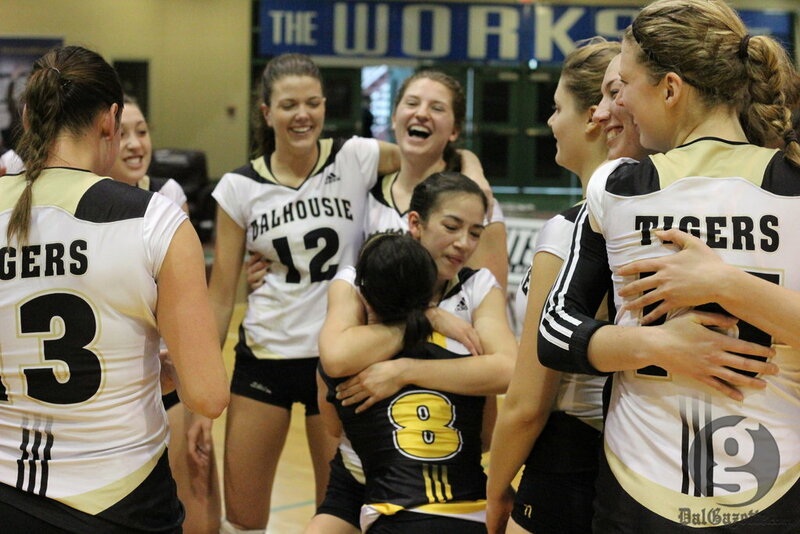 With one final point from veteran captain Louise Facca, Dalhousie’s AUS season ended in triumphant victory over the defending champion Saint Mary’s Huskies. The Tigers closed out the Huskies in straight sets, avenging last season’s championship loss to claim their first AUS title since 2005. 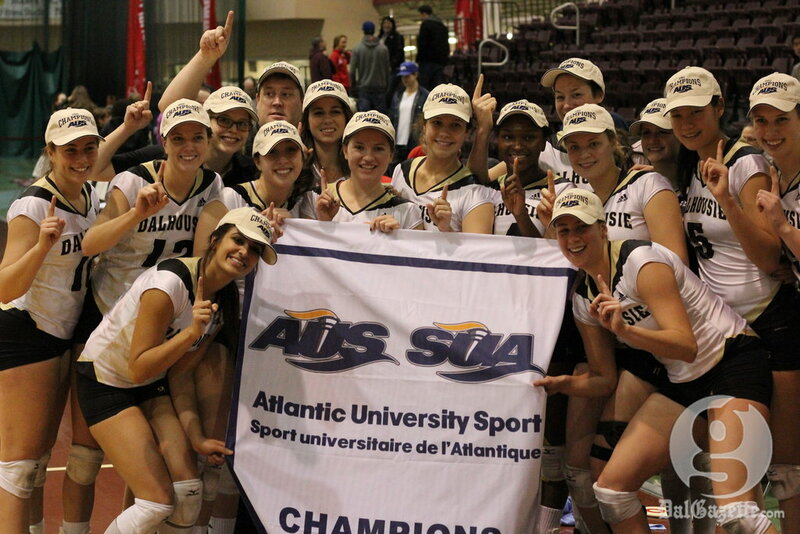 This marks a return to the upper echelon of Canadian university volleyball for Dal. The CIS No. 3 ranked Tigers will move on to the national championships at the end of this month in Sherbrooke, QC. The hard-fought final was a team effort for the Tigers, undefeated all season in conference play. The black and gold put pressure on their cross-town rivals right off the bat with a well-balanced front court attack coordinated by fourth-year setter Hilary Sears. This offensive output combined with solid blocking earned Dal a 25-15 first set win. The second-seeded Huskies, winners of five of the previous nine AUS championships, were outmatched by the surging Tigers, who continued their offensive onslaught in the second set, winning 25-12. “I think our blocking and our defence were the real keys to our success today. We did a real good job blocking early on—it set the tone. Defensively, we played really well, made it really difficult for them to score. That was huge,” said Scott. This season has been a trying one for Saint Mary’s, who started the campaign 0-5. Their fortunes turned around with the addition of Ariel Smith. Since rejoining the team, this season’s AUS MVP led the Huskies to a 10-3 record and a bye into the semis, where they dispatched Memorial 3-1. Despite their best efforts, the star-laden Huskies were helpless against a staunch Tiger defence. At the outset of the season, defence was targeted by Scott as an area of improvement for his team, and those results were evident in their sweep of St. Francis Xavier in the semifinals and the Huskies’ low scores in the championship match. The final set epitomized the Tigers’ season. Attacks rained down on the Huskies from the power, middle and offside positions, while the team’s hallmark defence and hustle kept their opponent at bay. Even when facing a late rally from the Huskies, Scott called a timeout, allowing his team to regroup and close out the game 25-13. With two straight sets victories in the playoffs, Dal has not lost a set in the past 11 games. While winning the title was special for the entire team, it has particular significance for player of the game Louise Facca. The graduating captain, who transferred from Bowling Green State University in Ohio four years ago, ended her career against AUS competition with the game-winning kill. “I know how bad Louise wanted to win. It’s just fitting that she gets the last point to cap off her AUS career,” Scott said. Facca’s mother Lorraine was a member of the 1982 Tigers team that won nationals, as well as a teammate of Dal’s director of varsity athletics Karen Moore. The Tigers of 2013 are now in contention to win the school’s first national title since that victory 31 years ago. For her tremendous efforts in the front court, Maggie Li was awarded championship MVP. Li and fellow second-year Tara Gowan scored 15 kills combined in Dal’s final victory. The Tigers will have most of its core returning next season, apart from the graduating Facca and Sears. But for now, the Tigers intend to enjoy the moment and get ready for nationals. “We’re just going to keep doing what we’ve been doing, [and that’s] working on our game,” said Facca. In 2009, Dal was well below .500, trying to iron out the kinks with a new coach after missing the playoffs for three seasons. Five years later, with their road to redemption complete, the team turns its attention to the national stage. If they can bring the same level of focus and dedication to this tournament as they did in the AUS season, roars of victory may become more frequent for these Tigers.